A private reading of Becca’s musical pilot The Songs of Bernadette took place in Manhattan in March of 2019. The Peculiar Tale Of The Prince Of Bohemia And The Society Of Desperate Victorians kicked off The 14th Annual Goodspeed Festival of New Musicals in January 2019. ABM Musicals got you a little something! Our musical Snow Way Out has been recorded as a radio play for The Micro-Musical Theatre Show, and you can listen to a ten-minute teaser for free here! We've got an all-star cast, too! You can subscribe to The Micro-Musical Theatre Show to hear a recording of the full show and even some upcoming bonus materials! Pour yourself some holiday spirits, kick back, and enjoy the show!! This past weekend, Dead Behind the Eyes or The Ingenue Play was one of six plays to be included in Vintage Theatre Productions' New Comedy Play Festival in Aurora, Colorado. The play received a public reading directed by Jennifer Schmitz. I'm currently in Denver with my frequent collaborator Dan Marshall working on Reunion Experience which will be presented at the Newman Center at Denver University throughout the month of August. FEATURING: Howie Michael Smith* (Avenue Q, “America’s Got Talent), Kat Palardy* (“New Girl,” “Brooklyn 99”), with Arielle Crosby, Aubrie Hamrick, Kyle Kemph, Cartreze Tucker, Katherine Goodwin, Evan Monteith, Samuel Pierce, Alex Seballes. The Reunion ‘69 and Reunion ‘85 experiences welcome audiences into an immersive 360-degree environment, where they enjoy improvisational comedy and beloved, iconic music of the era. After guests choose a fictitious identity, they grab a drink from the cash bar, meet old (and new) friends, listen and dance to a rocking band as they relive (or rewrite) their past. With four singers, five musicians, and two anything-can-happen hosts, audiences will celebrate the experience of a lifetime. I was very thrilled to see that Academia Nuts mentioned very kindly in an article on the place of fandoms in musicals and in musical theatre audiences. It is a great honor to have my musical included alongside Be More Chill, The Lightning Thief, Puffs, Harry Potter and the Cursed Child , and other excellent pieces of theatre. My collaborators and I have thrown ourselves into our next musical based on a true-life crime. I am loving the massive amounts of research we are doing and writing for characters who were real life people who pulled off impressive (albeit illegal) acts. Can't wait to share more with you once we've completed our first draft! A.B.M. Musicals was selected to attend an upcoming Writer-Producer Speed Date facilitated by Theatre Resources Unlimited. Becca Anderson and Julian Blackmore will be attending and pitching their holiday musical SNOW WAY OUT (written with Dan Marshall). We are grateful for the opportunity and looking forward to meeting the other writers and producers who will be in attendance. In SNOW WAY OUT, four strangers rent a rustic cabin each hoping for a solitary holiday. Blair, heavily pregnant, is trying to avoid her parents. Divorcee Charlie didn’t get invited to Christmas this year. Sherry, a pantheistic new-age spiritualist only wants to be with the ashes of her beloved Roger. And Colin, a product of the foster care system, always spends Christmas alone. But everyone’s antisocial plans are frozen when an AirBnB glitch and unforeseen blizzard leave them trapped in the same cabin. They have to overcome differences and work together if they want to get the Christmas they were hoping for. SNOW WAY OUT is an off-beat, 4-actor, 90-minute holiday comedy performed on a unit set with a small band (piano, drums, bass & wind). It’s great for date nights, office parties, and audiences seeking holiday entertainment that isn’t aimed at children. A relentlessly tuneful pop score pairs up with a side-splitting, farcical book and snappy lyrics by an award-winning creative team. A blackout, holiday spirits, and mysterious body bag converge to prove that even if you do escape your family, no one escapes Christmas. There’s SNOW WAY OUT! My frequent collaborators Julian Blackmore and Dan Marshall and I have launched a website specifically for our collaborative writing. Visit A.B.M. Musicals to find out more about our shows Academia Nuts, Snow Way Out, and The Suicide Club. President Mom has now had several productions across the United States, so I pulled together a sizzle reel from footage from one of the recent productions. Enjoy! Becca has written several educational songs for FunKiddzTV, an online educational series. Becca's lyrics can be heard in many of their videos, and she frequently gets to work with collaborator Julian Blackmore on these songs. You can follow FunKiddzTV on YouTube here. "FunKiddzTV is designed to engage and educate kids from all over the world through a series of upbeat animated Music Videos, stories and interactive learning. Here, your child can learn everything under the sun, from ABC to Animals, colors to shapes, and so much more! Our programming is among the best at helping children learn education basics in an entertaining way Here we house one of the internet’s largest collections of educational resources, nursery rhymes for children, and cartoons for the whole family. Our content is intended help grow with your child. Enjoy our huge collection of nursery rhymes for your children, that you and baby can sing together. Make sure to subscribe today so you don't miss any of the fun!" 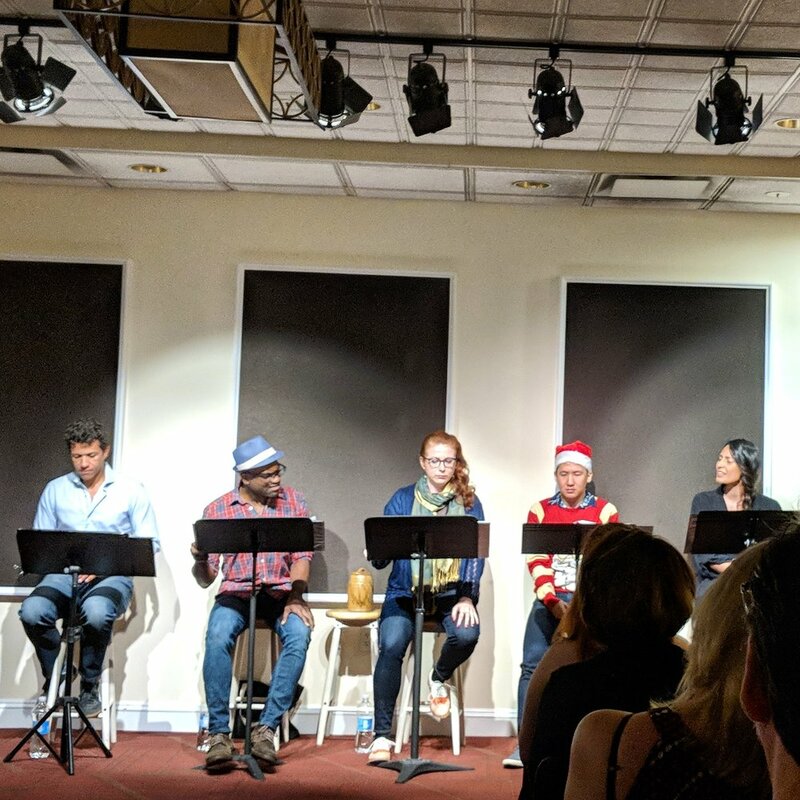 My collaborators Julian Blackmore, Dan Marshall, Thomas Caruso, and I were lucky enough to have a fantastic public reading of Snow Way Out at the York Theatre Company in December. The 90 minute 4 character musical closed out the 2016 Developmental Reading Series and starred Max Crumm, Lesli Margherita, Lance Rubin, and Aneesh Sheth. It was thrilling to hear the show performed by such an incredible cast of all-stars and to get feedback from a live audience for this new piece. Looking forward to sharing an update on the show soon. I've been collecting my thoughts on feminism/life in urban America on a separate website I'm calling Femme Chose. At Femme Chose, I've also been interviewing female writers and sharing those conversations via a podcast called Shakespeare's Sisters (a Virginia Woolf tip of the hat). You can check it out on the site or subscribe through iTunes. Check it out, and if you like it, be sure to write a review! If you're a female writer who'd like to be interviewed, send me an email at becca at whynotbecca dot com. A quick "Thank You" to CAP21 for always being a space dedicated to nurturing new musical theatre, but especially for allowing Becca, Dan Marshall, and Julian Blackmore to work on their Christmas musical Snow Way Out this week. The team is looking forward to continue to grow the show with CAP21. Becca and her frequent collaborator Hudson Meredith have started a comedy video channel called Bangs & Face. Website is forthcoming, but you can check out the YouTube channel now! Becca recently completed Sketch 101 at the Upright Citizens Brigade Training Center in NYC. Samples from her sketch portfolio are now on the site here. Becca was asked to write a guest blog entry for the Kevin Spacey Foundation about her experience as a grant recipient. Her blog can be found here. My full-length play will receive a workshop reading at The Blank Theatre in Hollywood on May 4th as part of their Living Room Series presentations of new works. I'm thrilled for this opportunity to hear this play in front of an audience for the first time and to work with theatre-makers on the West Coast. If you're in LA, come check it out for free at 8pm on Monday, May 4th at the Blank's Second Stage Theatre, 6500 Santa Monica Boulevard in Hollywood. I'd love to see you there! Dan Marshall and I just returned from an incredible week as the Tam & Young Arts Chair guest teachers at 'Iolani School in Honolulu. We taught twelve classes ranging from Finding the Writer's Voice to Quiet Subversion: Musicals of the 1960s, and we worked with over 100 students in the Upper School. The students were attentive, involved, endlessly creative, and open to dive outside of their comfort zones. For that, we'd like to say, "mahalo!" Additionally, Dan and I were lucky enough to get to take in some of the beautiful sights of Oahu. We enjoyed surfing The Seconds, swimming in the Makapu'u Tide Pools, checking out the swap meet at Aloha Stadium, and even running the Hapalua Half-Marathon!